You may remember, Monday, I mentioned that last Saturday night a few friends came over for drinks on the porch. 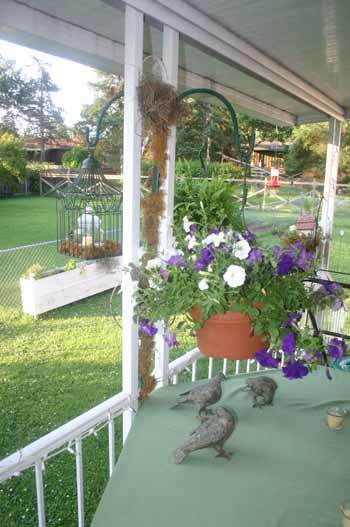 Well here are the pics for Tablescape Thursday with Susan at Between Naps on the Porch. 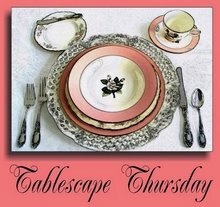 Click on the logo to see all of the tablescapes this week. I put up the hook, covered the bottom with moss, added a hanging plant on one side and a candle in a bird cage on the other. Added some good food and drinks. A robin had tried to build a nest in one of our trees and it had blown out. The nest is at the top of the hooks. 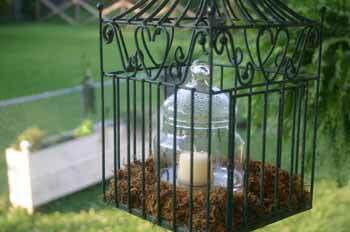 Here is the candle in the cage. As it got dark we lit the candles. We watched the fireflies, listened to the crickets and birds and visited and had a wonderful time. Wish all of y’all could have been there. I’ll admit, mine is not nearly as polished as the magazine shoot. I just used what I had on hand and I was not planning anything so formal as a wedding. I actually didn’t have to purchase anything for the shepherd hook look and I kind of like the shabby chic approach to this. I think there are a lot of possibilities here. Maybe in the fall, hang mums and wrap around a fall garland. For a patriotic look add red ribbon to the hooks and patriotic plant pokes to the hanging plant. I’ll try some different ideas and let you know how they turn out. Oh, by the way, my friends Mark and Kim brought the beautiful hydrangeas in the jar with the pretty plaid ribbon. They looked very pretty on the table. Wasn’t that so sweet of them? We kind of went with a Mexican flavor for the party and all of the recipes are on this blog. 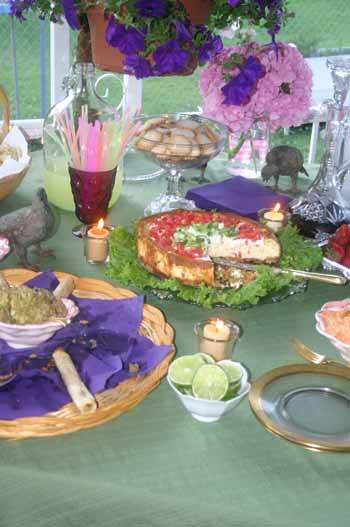 Southwestern Cheesecake, Shrimp Dip, Guacamole and Lemon-Thyme Cookies. This grilled shrimp would have fit right in! Drizzle enough oil over the shrimp to coat. Sprinkle paprika, garlic salt and Old Bay, to taste (I use about 1/2 teaspoon of each for 1 lb of shrimp).Place on wooden skewers which have been soaked in water for 1 hour. Put on grill, cooking until shrimp tails turn white. Flip and cook for 1 1/2 to 2 minutes more (depending on size). Squeeze lime over the cooked shrimp and serve as an appetizer, or add to corn tortillas for shrimp tacos. FA*BU*LO*US!! And the food looks sooo YUMMY! Thanks for visiting and for your sweet comment! Your table looks lovely and the food looks yummy! I love every single bit of this beautiful porch where friends gather. Beautiful table, love the double hook idea. Perfect! The recipe sounds devine..Great job and I am so glad you had such a nice time. Friends are such blessings…I just love ’em. Oh my goodness I am drooling at all those yummies~! GORGEOUS! GREAT GREAT GREAT, and thank you for that link! I love your creation. 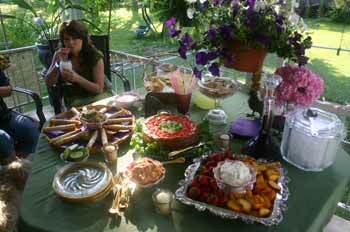 The food looks divine, and the candle and moss in the birdhouse – GORGEOUS! 🙂 Thanks for sharing such a great inspirational ‘scape today! Count me in… everything looks great! That is quite a spread! Everything looked delicious! I love all your party ideas! You did a great job, and it looks like so much fun. 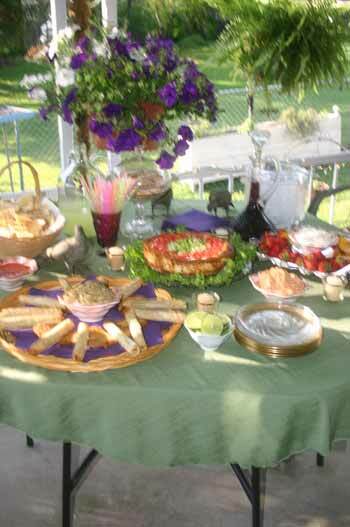 I really love those get-togethers like that with appetizers and good friends! I love the shepard’s hook, too, with the hanging basket and candle. Christi, this is sooooo pretty. Everything is so fresh and inviting!!!! 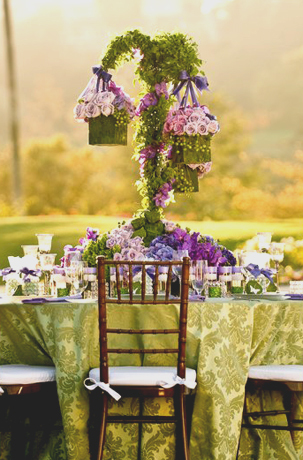 Absolutely a wonderful tablescape! Lovely and so fresh ! What a great idea! I like all your suggestions for other interpretations, too. Your table is lovely, and filled with fun and good food — perfect! What a great table for an evening sipping cocktails with friends. All of the food looks like artwork! It all looks fabulous! You did a great job. Ok, where was my invitation? LOL What a beautiful table full of good food! The way you interpreted the inspiration table is brilliant! Very nice party. The recipes look great, too. ~Wow! Christi what beautiful inspiration! You sure created it exactly and made a very elegant and fun look! It’s gorgeous! I like it! So pretty and that FOOD LOOKS YUMMY!!! all looks so summery and lovely! I enjoyed the visit and your table. Love it all! Beautiful table and delicious looking food! wow – this is beautiful and the food looks awesome! what a great inspiration pic! this is my very first tablescape thursday. very fun! Very nice!! What a spread!! Happy TT! 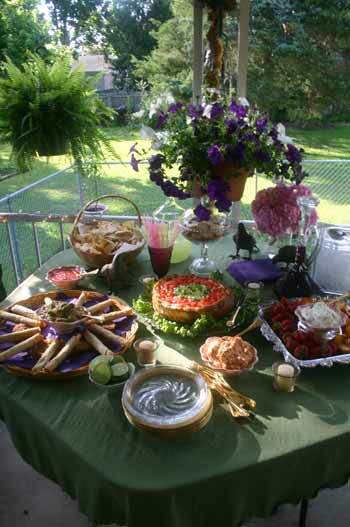 Your buffet table looks so yummy! It is so pretty, you did a great job. What a fun inspiration and yours is fabulous with all that great looking food !! Now this looks like a party I’d like to join! I think you did a great job! And what a fun looking party this is! Great job! I think you did a fine job with your inspiration table! Those apps look so good and it sounds like y’all had a great time!